Invasive species action plan, assessing LPC mitigation framework, honoring western conservationists & kids who love ferrets. Find out about the latest efforts to conserve the land, waters and wildlife in the West. 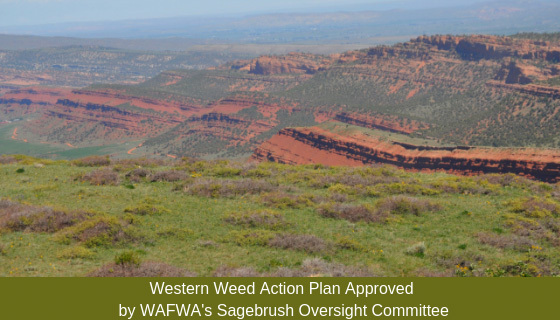 The Western Association of Fish and Wildlife Agencies (WAFWA) is working to implement the Western Weed Action Plan, which was approved by WAFWA?s Sagebrush Executive Oversight Committee at the North American Wildlife and Natural Resources Conference held in Denver last month. The action plan was created by a consortium of invasive species experts, including land managers, biologists, scientists and representatives from state and federal conservation and agricultural agencies. The action plan addresses the pervasive spread of exotic invasive plants across the sagebrush biome in 11 western states in the U.S. Those states are Arizona, California, Idaho, Montana, New Mexico, Nevada, Oregon, South Dakota Utah, Washington and Wyoming. The expansion of invasive plants like cheatgrass is negatively transforming more than 100 million acres of native sagebrush rangelands across the West. This transformation is having a negative effect on wildlife, recreation, ranching, and water quality, to name but a few impacts. Besides outcompeting native plants, invasives like cheatgrass are also changing the frequency and severity of wildfires. In Nevada alone, over a million acres of rangeland burned in 2018. Major natural resource management organizations, including WAFWA, the Western Association of State Departments of Agriculture and the National Association of State Departments of Agricultures have indicated they are supportive of the plan and are working on supporting resolutions that will underscore their commitment to its implementation. "This action plan is designed to be a blueprint for coordinated collaborative invasive species management efforts across the West," said Tony Wasley, Director of the Nevada Division of Wildlife and chair of the Sagebrush Executive Oversight Committee. "It's heartening to see support from all of the stakeholders who are concerned about this invasive species crisis. Now that support for the plan is being manifested across the West, we all need to work together to implement it." 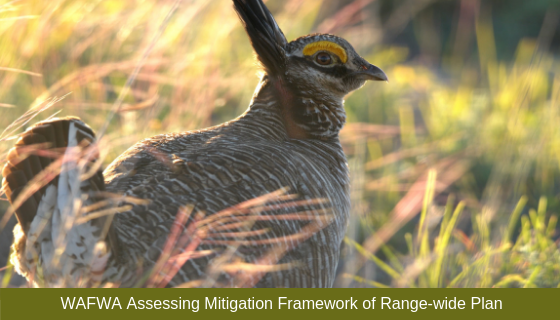 The Western Association of Fish and Wildlife Agencies (WAFWA) is re-evaluating its role in the administration of an industry mitigation framework that is one element of the Lesser Prairie-Chicken Range-wide Conservation Plan. As part of the discussion, a partnership with Common Ground Capital is being explored. Common Ground Capital is a private sector conservation mitigation banking company that has the only species programmatic conservation bank agreement in the country which covers the entire range of the lesser prairie-chicken, and has been approved by the U.S. Fish and Wildlife Service (USFWS). Along with discussions regarding a potential partnership with Common Ground, WAFWA's executive committee voted on March 6 to undertake a thorough review and audit of the mitigation framework that is part of the plan. Undertaking a five-year program review was a commitment made by WAFWA when the Range-wide Plan was approved in 2013. As a result of the pending review, new enrollments in the plan will be suspended until the audit is completed, which is estimated to take about 30 to 60 days. WAFWA?s executive committee also voted to take steps to ensure funding is available for critical program operations, which will include providing services to industry partners and landowners currently participating in the program. 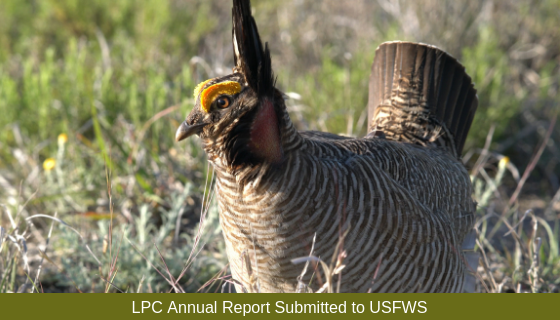 On March 29, the fifth annual report on the implementation of the Lesser Prairie-Chicken Range-wide Conservation Plan was submitted to the U.S. Fish and Wildlife Service. The report documents progress made toward goals laid out in the plan, including lesser prairie-chicken population trends and mitigation projects. 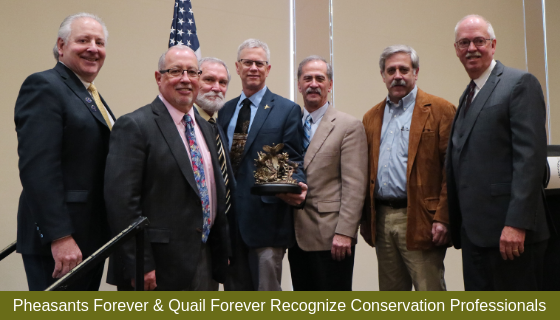 Five conservation professionals were recently honored by Pheasants Forever and Quail Forever during the North American Wildlife and Natural Resources Conference in Denver last month. Conservation Service Awards were presented to Tim McCoy, Deputy Director, Nebraska Game and Parks Commission; Kelly Hepler, Secretary, South Dakota Department of Game, Fish and Parks; Terry Steinwand, Executive Director, North Dakota Game and Fish Department, Steve Williams, President, Wildlife Management Institute; and Larry Kruckenberg, WAFWA?s outgoing Executive Secretary. 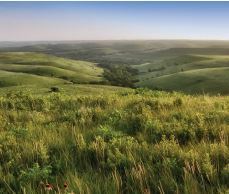 The award winners were selected for their distinguishing contributions to wildlife habitat conservation efforts nationwide, including landscape-level habitat improvements through cooperative partnerships and direct mission delivery of Pheasant Forever and Quail Forever programs focused on upland birds and other wildlife. ?These Conservation Service Awards recognize individuals who have helped impact the mission of our organization through habitat improvements, public access, policy, and R3 initiatives in the United States,? stated Howard Vincent, president and CEO of Pheasants Forever & Quail Forever. ?These folks represent the real foundation of our organization, footings based on input from dedicated and proven wildlife natural resource professionals. We are grateful for their guidance and input.? The students at Dunn Elementary School in Fort Collins, Colorado are very fond of black-footed ferrets. 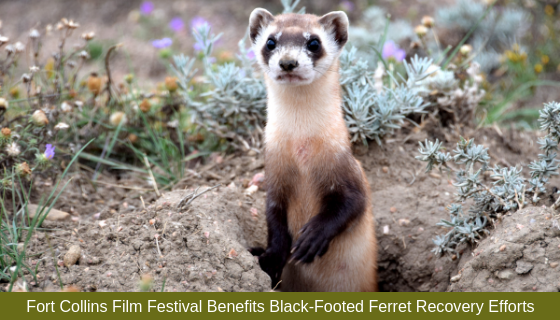 In fact, the students helped organize a wildlife film festival and donated all the proceeds to the Black-footed Ferret Friends Group. Friends group funds are held by WAFWA and disbursed for on-the-ground conservation efforts for the iconic little critter. An outreach specialist with the U.S. Fish and Wildlife Service was on hand at the event with a black-footed ferret and the children and their parents learned more about how the species is being recovered and returned to the wild, including at a recreation area in Fort Collins. The Fort Collins recovery effort was also featured in a short film. More than 350 people attended the event and close to $500 was raised to help the recovery effort. The film festival underscored an important lesson for the attendees: "Think Globally and Act Locally." Western Association of Fish and Wildlife Agencies 2019 All rights reserved.